West Mayo is one of Ireland’s most exhilarating, diverse and beautiful walking destinations. It offers not only wild mountain scenery but also dramatic coastal walks and seascapes.The vast Nephin Mountain Range and iconic seascape of Clew Bay, with its drowned drumlin islands, provide spectacular view and ever changing hues. Mayo is a county of great geographical contrasts, offering walkers a quality of terrain that few places can compete with. The village of Mulranny lies on an isthmus, a convergence of land and sea, a crossroads of marine and terrestrial habitats. 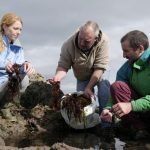 Such is the quality of environment here that a trio of European conservation areas and Ireland’s largest National Park converge on Mulranny. We have outlined below both the Waymarked Walks which are suitable for walkers of all ages and the Guided Walks. Our Local Guides are happy to walk and talk with you and you will discover spectacular landscapes and the amazing ecosystems that created them. Why not learn about the events and people that shaped the history of west Mayo. 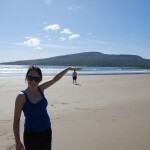 Starting at the Mulranny Park Hotel this is a walk of stunning beauty and immense diversity. Such is the biodiversity here, that you enter three different European designated areas of conversation and Ireland's largest National Park. On the way visit Ireland's only stand of Mediterranean heather, woodland, beaches, rare Machair dunes, Atlantic salt marsh and traverse Trawoughter Bay along Mulranny's unique causeway. The route features elevated views of the dramatic deep sided Bellacragher Bay and to the south the stunning spectacle of Clew Bay and its drowned drumlin islands set against the majestic Croagh Patrick. Recommended: Boots, waterproofs, walking stick, binoculars, water & snacks. You can visit Kileen Cemetery which has on old burial ground surrounded by stone. The cemetery contains graves dating back many years. Saint Brendan’s well is also located nearby. According to legend this well was located in the cemetery but the devil attempted to throw it into the sea. It landed close by on the shoreline and remains there to this day. Also worth a visit on these loops is Roigh Pier. The pier is situated on the shores of Clew Bay and dates back to the early 1800s. Used by local fishermen and islanders at the turn of the century it was renowned for herring fishing and the ferrying of turf to the islands on Clew Bay. Stop and admire Carrickahowley Castle which was built in the sixteenth century. The castle name in Irish translates to Rock of the Fleet. This is where the local area’s name comes from today. The castle belonged to the pirate queen Grace O’ Malley. After you finish a loop in Tiernaur you will have explored bogs and foothills, crossed rivers, enjoyed spectacular views, experienced local history, passed by lakes and travelled the rugged coastline in a few hours. Exhilarating walks suitable for walkers of all ages. No. of Trails: 3 in total ranging in distance from 9 km – 16 km. The Lettermaghera loop has its own unique terrain. The loop ambles through a scattering of lakes large and small. This trail begins at Derrada Community centre. As you head north along a narrow country lane you will enter a maze of small lakes. Soon after you will reach the largest lake on the loop, Furnace Lough. This Lough is home to the Fisheries Ireland Salmon Research Centre. From the junction at the salmon leap you head west along the slopes of the Bengorm Mountains. These slopes will offer you some of the most panoramic views of Clew Bay and its islands. The Lettermaghera loop is suitable for all fitness levels and has something of interest for all the family. Location: Between Mulranny and Newport. Location: 10 km from Newport. Terrain: Country Lanes, forest tracks and bog lands. Further information on the Letterkeen loop can be found here. The Trail follows an old drover path which may date from the Iron Age. There is, along the route, evidence of previous human habitation, particularly from the mid 19th century just prior to the Irish Famine when population pressure in this area was intense. Between the 16th century and the early 20th century English Landlords owned vast estates across Ireland and these Landlords would have been responsible for the maintenance of the sections of the trail that passed through their lands. The trail was the main route for people and livestock before roads were built in the area in the first half of the 19th century. Clew Bay is one of Ireland's most iconic seascapes, and a "must see" for any visitor. 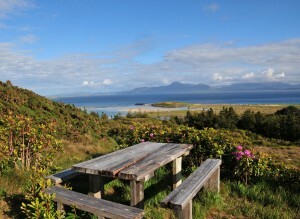 Initially you will explore Mulranny's Machair sand dunes, one of Europe's rarest habitats. These are dynamic landforms renowned for their variety of wild flowers, they feature a variety of habitats including beach, dune, mudflat and Atlantic salt marsh. Rosmurrevagh is a fine example and home to rare species of fungi, moths and curious beetles. Historic sites on the route include a Celtic Midden, a Killeen, Gairí Beagh Na bPáistí, (the Children's small garden), a fairy fort Blea Na Shee, (the curve of the fairies) a fine lime kiln and the magnificant single arch Washing Pool Bridge. Rosturk takes you deeper into the bay offering exceptional views of Clew Bay's drowned drumlins, a beautiful legacy of the last Ice Age. You can walk past the historic Rosturk Castle and the guides offer a unique opportunity to access the once inhabited island of Moynish Mór. The guided walk starts in the neighbouring town of Newport at Newport Church with a guided tour of the priceless harry Clark stained glass window collection including "the Last Judgement" scene. The walk takes in the view of the magnificent seven arch old railway viaduct, before heading out to Burrishoole Friary, established in 1469. You will then take in an elevated viewing point of the rustic seven arch Burrishoole bridge followed by a guided tour of the intact fortress of Gráinne Uaile (Grace of malley) the notorious pirate queen of the Sixteenth Century. The walk passes Roigh Pier and Saint Brendan's Well before veering north for the Nephin foothills and then west along a mountain track through Tiernaur (the Land of the Slaughter) across the impressive Washing Pool Bridge and on to your destination the Mulranny Park Hotel, built in 1897.